In this article, you will learn what “mouse shoulder” is and how it can be treated. Mouse shoulder refers to pain on the shoulders that comes about due to using your computer with a mouse without the appropriate arm support. The condition can develop over weeks or months. The repetitive strain injury (RSI) results from constant repetitive movements in a limited area and can lead to pain on your upper back, neck, and shoulder. Mouse shoulder may also be referred to as work-related upper limb disorder or repetitive strain injury. How Does Mouse Shoulder Occur? If you work in an office setting, you probably spend hours every day with one arm extended on your mouse, dragging and clicking items. According to the Canadian Center for Occupational and Health Safety, we use the mouse three times more than the keyboard. Repetitive use of the mouse is common when you are working or playing video games. 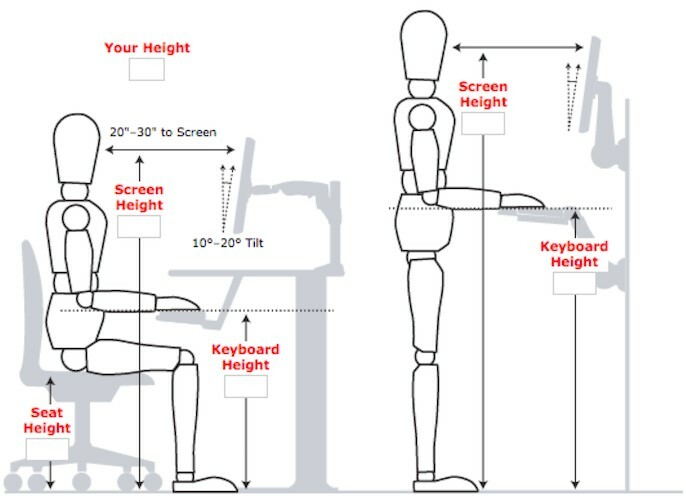 If you have set up an ergonomic workstation, the mouse could be too high or too low. The workstation could also be set up in a way that your arm has little or no support during the day. When the mouse is too low, you will constantly be extending your arm towards it. On the other hand, if it’s too high, you will frequently be tensing the muscles in your shoulder and upper arm. Over time, the stress on your arm can pile up and lead to a repetitive strain injury. This is what happens with the case of a mouse shoulder. There are various reasons why you may experience a mouse shoulder. To begin, when using a mouse, you make small, focused movements with your fingers and hands. Over time, the small muscles that enable the focused movements can get fatigue. The fatigue can lead to tension of larger muscle groups that try to compensate. The shoulder and shoulder blade are attached to the body through different muscles that insert into the base of the skull, neck, ribcage, and the spine. When you hold a mouse with the arm held away from the body, the muscles contract as they support the weight of the extended hand. Sitting in this position for several hours without frequent variations can lead to muscle weaknesses and pain. Apart from using a mouse, similar repetitive strain injuries can occur if you engage in repetitive activities such as performing a predetermined set of manual labor tasks or using industrial machinery in a precise manner. In most cases, you will experience a few of these symptoms. If the pain is not addressed on time, it can affect the overall quality of your life. If you suffer from shoulder pain from computer use, there are a number of treatments you can do in less than five minutes. Break the repetition. Take regular breaks from the computer to stretch your arms and hands (see image below). Place the mouse in a position where you can easily reach it. If this is not possible, see the other options below. Set up your workspace in an ergonomic way. Follow the graphic image below. Even if you go for physical therapy, the mouse shoulder will return if you do not have a good workspace setup. You can also get relief from mouse shoulder by using an armrest or a different mouse. For example, you can use a mouse with a trackball or a vertical mouse. Another option is to invest in a specially-made computer arm-rest for supporting the weight of your arm. You can find the arm rests for under $100. As the muscles get fatigued during the day, we tend to start slouching, which worsens our posture and strains our body. You can improve your posture by engaging in activities like core strengthening exercises, Pilates, tai chi and yoga. Other ways in which you can improve your posture during the day is by setting reminders using a posture app or sticky notes. You can also try mouse shoulder exercises to reduce pain resulting from computer use. The video below from Coach Deb Fitness is a great start. However, consult your doctor before starting the exercises. RSITips.com also has a Q&A series with some exercises that you can do for shoulder pain. If you have mouse shoulder or wrist pain due to gaming, you’ll find invaluable information on stretchers and exercises for reducing pain on this Reddit thread. You can also download this quick shoulder exercises infographic that you can keep open on one screen throughout the day to serve as a reminder. For the best results, these therapies should be used in conjunction with other modifications at your computer. If you do not address the sources of the mouse shoulder, the pain could come back. Shoulder joint injections may be recommended by your doctor to manage inflammation and stiffness in the joint. The injections are typically a mixture of steroids and anesthetic. However, some pain specialists are starting to use regenerative therapies like PRP. Injections are safe and effective in reducing severe pain on in the joints. The video below shows how a knee joint injection is done. From the video, you will get an idea of what you should expect if you are going for a shoulder joint injection. Generally, shoulder joint injections should be administered in addition to other forms of therapy like physical therapy and workplace modifications. These modifications will help you engage in exercises that will build your muscles while reducing pain for moderate periods of time. A chiropractor can manipulate misaligned joints on the neck and shoulders that may be due to muscle strains or tension. Chiropractic care can help to resolve postural problems that lead to repetitive strain injuries such as a mouse shoulder. Apart from changing your ergonomics setup, you can also try massage. Regular massaging can help to reduce shoulder pain from stress and relieve tension in the shoulders. Other benefits of getting a massage include alleviating and preventing issues that arise from sitting in front of a computer for hours on end. A physical therapist can help if you are suffering from advanced forms of pain. In most cases, the therapy treatment will take a few months and will mostly comprise of observation and recommending exercises. The exercises recommended will be aimed at improving the balance of your core muscles, i.e. across your back and across your chest, and increasing the mobility of the affected shoulder joint. Some people suffering from shoulder pain have found relief with acupuncture. The treatment is non-invasive and does not rely on medications. The treatment can be effective in some cases but is not recommended for long-term use. You can go for acupuncture treatment in addition to physical therapy and other shoulder pain exercises. If you have undergone various therapy sessions but are still experiencing shoulder pain, it may be time to see a pain specialist. A specialist can help to diagnose the cause of your pain and, if needed, provide treatment options such as shoulder joint injections. If you are suffering from pain, take steps to resolve the underlying issues. There are different causes of mouse shoulder, which can be addressed through specific treatments. The earlier you address the cause of your pain, the more likely you will get relief from shoulder pain.